Are you interested in studying business and management? Would you like to study in English and meet extraordinary professors from around the world during your studies? Or, are you already in working life, but are considering updating your skill set through our MBA-programme? Visit us to find out if HELBUS would be right for you! 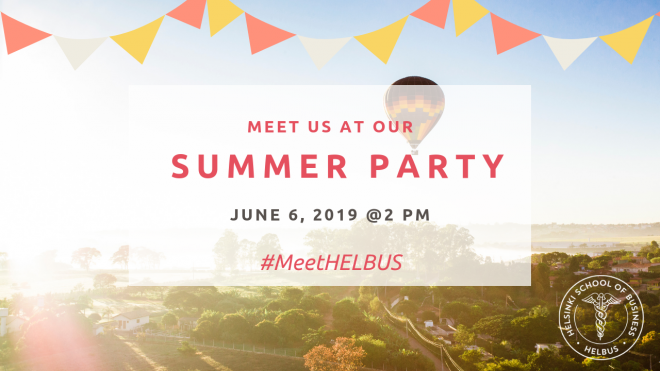 Our fun and casual free event MeetHELBUS! will be held on Thursday, June 6th at 2-4 p.m. at our new campus in Pitäjänmäki, Helsinki. Refreshments are served! Sign up for the event here by Monday 3.6. You can also bring along a friend or your parents if you wish. Looking forward to seeing you there!